In ancient times these “gems of the sea” adorned royalty, aristocrats and the very wealthy. In early Asian societies, pearls were viewed as physical symbols of purity, chastity and feminine charms. As early as 2500 BC, there was a substantial pearl trade in China. Later the jewels found their way to India, Egypt, Persia and Rome. The lure of pearls brought Spanish adventurers to America, who heard reports of the vast pearl treasures held by Indians. In fact, Native American burial mounds in the Ohio River Valley were found to contain huge quantities of freshwater pearls dating back to as early as 200 BC. According to historians, in the Roman period pearls were prized by both men and women. The gems were considered so valuable in some cultures that their ownership was restricted by law. American Indians used freshwater pearls to create jewelry, headdresses, figurines and other treasured objects. The most famous pearls in the world are the largest, rarest and most beautiful. The Hope Pearl weighs 4.50 carats and is two inches long. It is on display at the South Kensington Geological Museum in London. La Pellegrina, which is displayed in the Museum of Zazima in Moscow, weighs in at 27.9 carats. The Miracle of the Sea is the largest pearl in existence, weighing a whopping 297.8 carats! Pearls are produced by mollusks – the common name for a phyllum of soft-bodied animals that usually have a hard shell. Specifically, pearls are created by the class of mollusks known as bivalves, which include clams, oysters, mussels and scallops. In saltwater, pearls are formed by oysters, while in freshwater lakes and rivers, they are produced by mussels. Natural saltwater (also called Oriental) pearls are formed when sand or shell particles are caught in an oyster’s “beard” as it moves along the sea floor. The irritant settles in the soft body of the mollusk between the shell and the mantle. The oyster (not the edible variety) secretes fluid to protect its body from the irritation. This secretion, called nacre (pronounced nay-ker), gives pearls their iridescent color. Nacre surrounds the particle (known as the “nucleus”) in concentric layers, which build up to create a richer and deeper luster. Over the centuries, traditional harvesting techniques proved very time-consuming and produced few jewelry-quality pearls. Divers descended to the ocean floor armed only with a knife and a basket. The diver cut each oyster loose from the plants surrounding it and placed it in the basket. After 3-5 minutes of harvesting, the diver returned to the surface and emptied the basket of oysters. The few gem-quality pearls recovered varied in size, shape, color and quality, making it nearly impossible to find similar or matching pearls for a necklace or earrings. Before oil became the preferred commodity, the Persian Gulf supplied most of the world’s saltwater pearls. Today, saltwater pearls are found along the coasts of Africa, Australia, Spain, Portugal, Japan and the South Seas. Native Americans of the Atlantic coastal areas and the Mississippi River basin were the first to collect and use freshwater mussel pearls in America. Today, freshwater pearls are cultivated in 31 United States. Cultured pearls are defined as pearls created by oysters through the inducement of man. They have become highly desired because of their uniformity in size and shape. They are genuine pearls – cultivated with a little help. Many attempts were made over the years to entice oysters to produce a greater number of high quality pearls. But success didn’t come until the 20th century. In the early 1900s, three Japanese men working independently discovered a method of inducing pearl growth that gave rise to the modern cultured pearl industry. Most of the world’s cultured pearls are produced in Japan, Australia and the South Seas. A skilled technician opens the live oyster, makes a small incision in the mantle (tissue) and inserts a nucleus. The nucleus usually consists of crushed bits of oyster shell. More than one nucleus is inserted into each mollusk during this procedure, thereby increasing the chance of creating a viable pearl. Following the insertion, the oyster is placed in a tray of water to rest. The live oysters are then transferred to a cage and lowered into the sea to live while the nacre builds the pearl. When this method was first developed, pearls were allowed to incubate for three years. Today, most pearls are harvested after six to eight months, which affects the size and shape. Higher quality pearls still take between one and three years to form. South Sea and Black Pearls – South Sea pearls are both very rare and valuable. They are quite large, ranging from 10 to 20 millimeters in diameter, compared with a typical cultured pearl of 2-10 millimeters. The term black pearl is used to describe any pearl dark in color – gray, silver or black. Most are cultured in the South Pacific, primarily Tahiti. Seed or Blister Pearls – Created by farm-raised oysters when sand enters the shell during feeding and is surrounded by nacre. These small pearls are used to complement larger pearls or other gems used in jewelry settings. Mother of Pearl – A secretion from the oyster that is thinner than nacre and protects the mollusk from its own shell. Its iridescent layers are used in decorative applications. Mabe Pearls – Assembled from cultured half-pearls and mother of pearl, mabe pearls are popular in high-fashion jewelry. A blister is produced by placing a half bead of plastic, glass or other substance flat side against the shell of the oyster. The oyster then covers it with a solution that is partly nacre and partly mother of pearl. Mabes are created in round, oval and pear shapes. Rice Pearls – Produced in China, these naturally occurring pearls have a long, irregular, dented shape resembling Rice Krispies. Biwa Pearls – Originating in Japan’s Lake Biwa, these naturally occurring pearls are larger and flatter than the Chinese pearls, with a fine color and luster. Cultured Freshwater Pearls – These freshwater pearls are cultivated to produce a smooth, more uniform pearl. They are grown in mussels without using a hard nucleus. Instead, they are cultivated by inserting into the mussel a small piece of mantle tissue from another species. Furthermore, as many as 30 to 40 pieces of tissue can be inserted in freshwater mussels, creating a much higher yield than is possible using their saltwater counterparts. To create larger pearls, the pearl is allowed to build up more nacre over many years – typically six to eight years for the largest 11-12mm size pearls. Pearls are measured in millimeters across the diameter of the pearl. Most pearls sold in the U.S. are between 5mm and 7mm in diameter. Once removed from the oyster, pearls are first sorted by size and then by color and shape. Because they are created by nature, pearls will have their own birthmarks – blemishes or irregular surfaces. Pearls with only a single blemish will be used for earrings, cuff links and tie tacks. If a pearl has blemishes on opposing sides, a hole will be drilled through the middle so the pearl can be strung for use in necklaces. Pearls of similar size, shape and color are strung together with silk thread. The thread is knotted at the drilling point to prevent the pearls from rubbing against each other and destroying the natural luster. This practice also gives the necklace more flexibility and prevents the loss of more than one pearl should the string break. Seven key factors define the quality of a pearl. Here’s how each one affects the value and beauty of pearl jewelry. Luster: Luster is the direct result of the amount of nacre used in the formation of the pearl. It’s what gives a pearl its unique glow and beauty. Factors such as water temperature and the diet of the oyster can affect the luster of the pearl. Colder waters produce pearls with smaller amounts of nacre, while warmer waters provide a thicker layer of nacre. Pearls that are semi-transparent display a higher degree of luster, thereby increasing their value. Size (diameter): As with most gems, the larger the size of a pearl, the greater its value. Pearls are generally between 4mm and 10mm in diameter. Pearls of a larger size than this are extremely desirable and expensive. Size is determined by the combination of nucleus size, nacre depth and length of growing time. Color: The color is largely determined by the species of oyster that produced the pearl. Different colors are more highly desired in different cultures around the world. This creates a market where all colors, such as rose, gold, gray and golden, are equally in demand. The value of the pearl is then determined by the demand in particular parts of the world. Pearls can be dyed or bleached with medicinal dyes to enhance their look. Black, gray and blue pearls from the South Seas come by their color naturally, which makes them extremely valuable. Some pearls have one or more colors which overlay the basic color, known as an overtone. Pearls whose overtone colors enhance the original color are considered very valuable. Nacre Thickness: The thickness of nacre affects the durability – and sometimes the beauty – of a pearl. A thick nacre will sustain more handling and normal wear. A thin coating can be more easily worn away, thereby exposing the nucleus of the pearl. Blemishes/Spotting: Perfect pearls are extremely rare. The value of pearls is determined by a lack of blemishes and other imperfections. The smoother the surface, the more valuable the pearl. Pearls are graded according to size, number, locations, visibility and types of blemishes. Most pearls are considered slightly to heavily blemished. Shape: The most desirable pearls are perfectly round or spherical in shape. 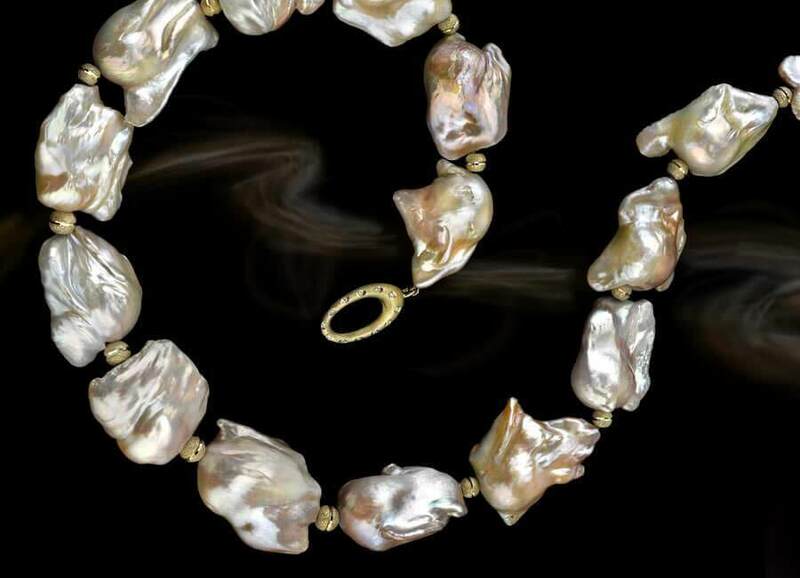 Other shapes – off-round, egg-shaped, or baroque (irregularly shaped) – are less valuable to pearl buyers. The shape of a pearl is determined by a combination of factors including the shape of the nucleus, water current, water temperature and the location of the implant. Consistency: Consistency in size, color, shape, blemishes and transparency help define the value of a pearl strand. The more consistent the pearls, the higher the price. If smaller pearls are included in a strand, they are usually found near the clasp in the back. The quality of the drilling in the strand is also important. Pearls that are drilled off-center will hang out of line with the rest of the strand, thereby decreasing beauty and value. Minimal skin blemishes – the fewer blisters, pimples or spots, the more attractive. Roundness – the more perfectly round the better. Luster – the higher the luster the better. Tint – rose-tinted pearls are considered the most valuable, although there are also white and cream colored pearls that are highly desirable. Size – Oriental pearls (natural) are sold by weight. Pearls are weighed as “grains,” with four grains equal to one carats. Cultured pearls are measured in millimeters. The larger the pearl, the greater the cost. For example, the price jumps dramatically between 7 1/2 mm and 8mm, which is considered large – or between 9 and 10mm, which is very large in size and very high in price. In fact, once you pass 8mm, the price escalates rapidly with each millimeter increase.